According to a recent survey, many developers would like to create their own business selling software products to many customers but they do not have any good ideas of products that could sell well. Fortunately there are methods that you can apply to come up with good software product ideas and then figure if they have good market potential even before you start developing the software products. Watch this video with a consulting session with a developer to learn more about those methods, so you can start applying them to have great software product ideas with good business potential. How to discover software product ideas that can become promising business? Recently I started a survey on a Facebook group for PHP developers the evaluate the interest of PHP developers on becoming entrepreneurs and work on the projects they want, with the technologies they want, anytime they want, from where they want. As you may see over 60% of the people want to do it, I mean they want to create a software product business, but have not started. Most of them are not sure what products they could develop as demonstrated by the top response. Coincidentally, just a few days after the survey was taken, one developer contacted me to ask precisely about how he can discover good ideas for software product businesses. Fortunately there are several methods that you can apply to discover good business opportunities by yourself even before you get started developing anything. 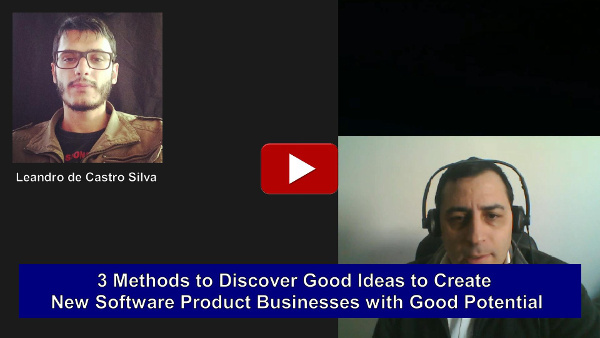 Therefore we recorded a free consulting session, so you can also learn about 3 methods that I recommend to apply in order to discover good software product ideas and then evaluate them to filter out those that are not so good. My goal is to build a community successful developers that not only create nice software that they like, but also are independent and have autonomy to work on what you want. As a community we can help each other and be more successful then when we work alone.